Hook Style Sharpened points with knurled center. Length 7-1/2" 52.925 Chisel Type Scriber made of steel with one sharp point for scribing and a sharpened chisel end. Length 6 1/2" 52.928 Diamond Tipped Scriber can be used on hard jewels, metals, etc. Hexagonal aluminum handle prevents rolling on bench. Length 5-1/4". 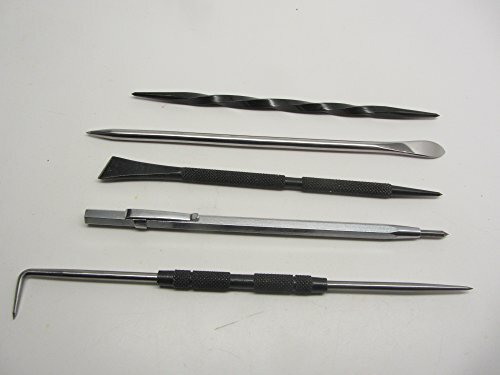 52.954 Twisted Scriber Overall length: 6-1/2 Double End. For easy, precise engraving, scribing or marking on glass, metal, plastic and ceramic. Scriber/Burnisher Made of steel with one sharp point for scribing and a curved, rounded end for burnishing. Length 7". View More In Etching Tools. If you have any questions about this product by UJ Ramelson Co, contact us by completing and submitting the form below. If you are looking for a specif part number, please include it with your message.